Microsoft has pretty much owned the whole online document software market ever since the 90s, but Google has bravely has gone after the throne with Google Docs. Offering all the qualities of Microsoft Office, Google Docs integrates the power of on-the-go office tools and top notch quality. But the whole online concept of Google Docs does become limiting when you want to make Google Docs available offline on Android, or does it? The suite of office tools in Google Docs are not only available for free, but also across all platforms. With the help of Google Drive, you can use Google Docs to save documents in the cloud, view and save them on your Android device for offline viewing. You can choose to make all your Google Docs files available for viewing offline, or cherry-pick the files. Note: You can use the same methods mentioned below in the Google Sheets app to make spreadsheets available for use offline. This is perfect if you have plenty of SD storage space on your Android device and want to save all the recent files in Google Docs available offline. 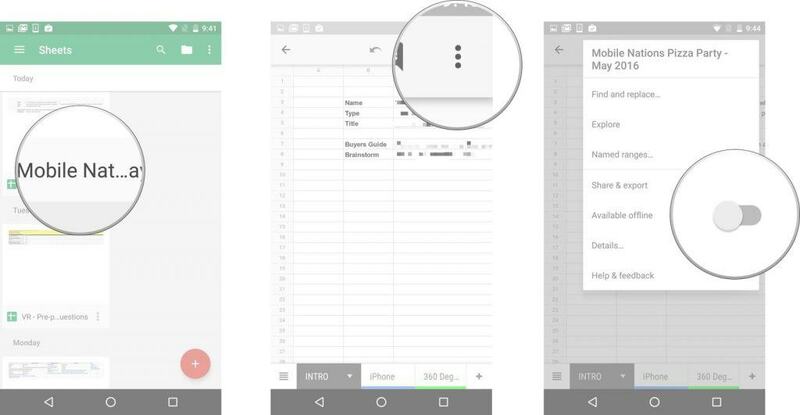 Launch the Google Docs app on your Android device from the app drawer and tap on the three-line hamburger menu button. On the slide-out menu, tap on “Settings” and then press the toggle switch next to “Make recent files available offline” to activate it. Once the toggle switch turns blue, exit the Settings menu and wait while Google Docs stores all recent files to your Android’s local storage. If you don’t want to clutter your Android device’s limited storage space with all the recent files in your Google Docs account, you can also select individual files and save them. Head over to the Google Docs or Google Sheets app and tap on the document you wish to make available for offline viewing. Press the three-dot menu button on the top-right corner of the screen and press the toggle switch next to “Available offline”. Once the toggle switch turns blue, the app will save that file to the local storage on your Android device. Has Google Docs become your go-to office tools suite, or does your work life still thrive at the mercy of Microsoft Office? Let us know your preference in the comments section below.